Today SCACD is formally premiering the SCACD Digital site by adding over 35 images designed by Carmen Medlin!!! 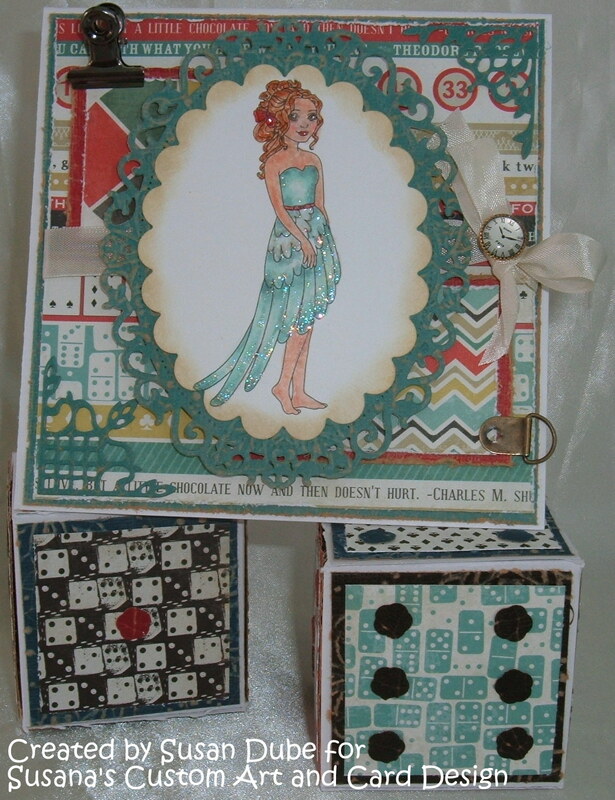 Carmen's range is fun, fresh as well as elegant and will have something for everyone. 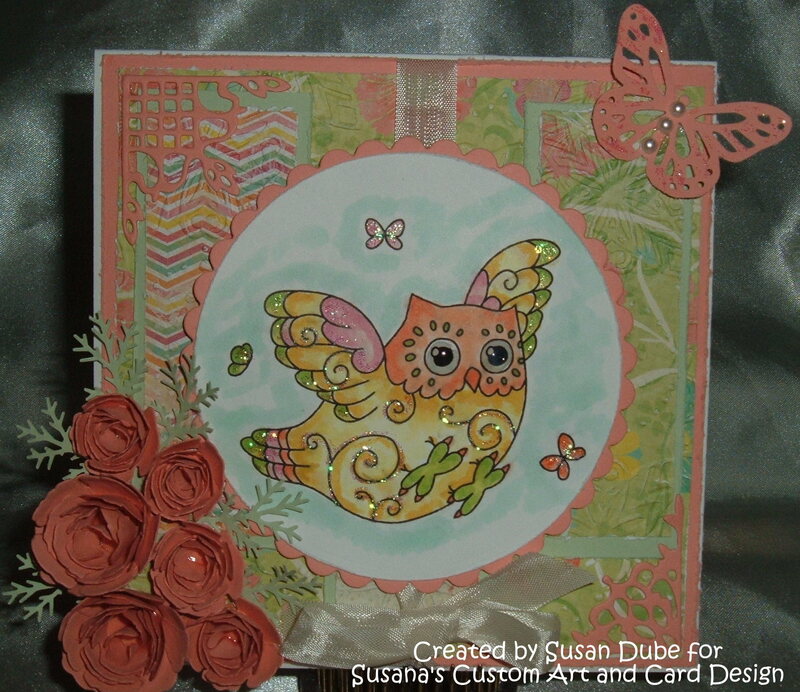 Susana has added quite a few never before seen Fab images as well as taken some classic past rubber stamps and turned them into digi for this release. Join us today to celebrate this release with the SCACD DT as well as bunch of amazing Guests J If you loose your way check out the Store Blog for the entire list. 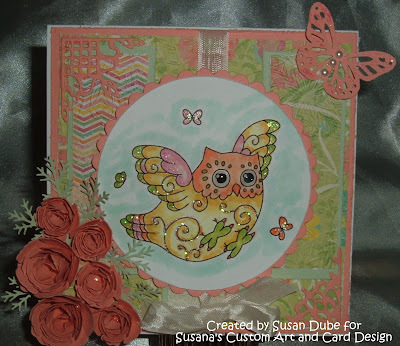 I'm so excited to get the chance to help launch this new division of digital stamps for my dear friend, Susana! We go way back and Susana's team was my very first design team and if I'm honest, I should have never left! She got me started on my road to papercrafting and the stamping world for me! I owe her so much and love her muchly! 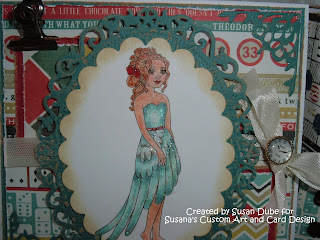 If you've come to my magical place from the oh so talented Melanie's blog, then you're on the right track. If not, head on over to Alex's blog and start at the very beginning. I don't want you to miss out a single image! There's so much talent here and they're gonna rock your world and set your weekend off on the right foot! I'm so excited to present Aviana, but I've made her up as Luck be a Lady tonight! Isn't she just gorgeous? I can think of so many different ways to color her and different occasions to use her for! Can't you just see her flying in and sprinkling good luck all around? I sure can! 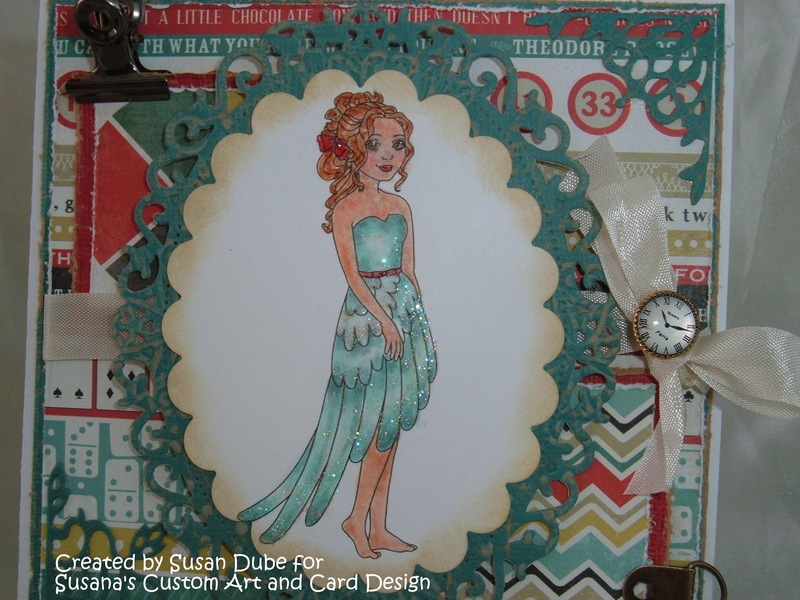 She's colored with copics and the papers are Carta Bella's Well Played paper pack and Core'dination's Shattered Collection Paper. I added some Diamond Glaze to her hair bow and belt and Stickles in Stardust to her dress. 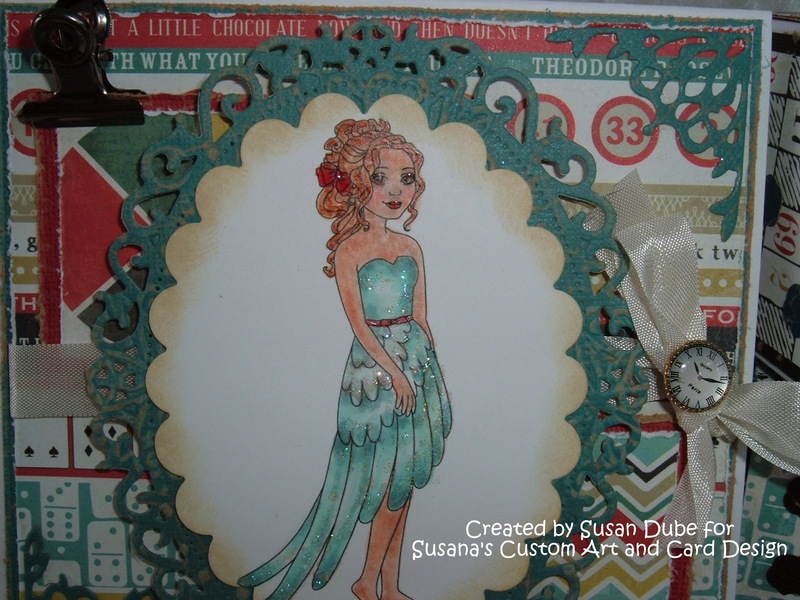 I used Floral Oval frame and scalloped oval dies from Spellbinders to cut her out and Classic Corner Dies from SCACD on the corner. 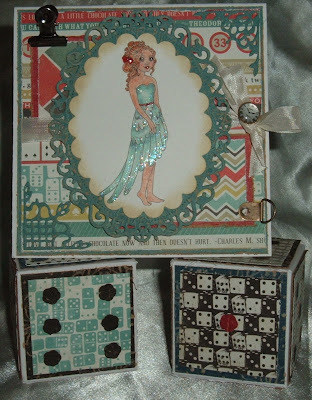 The metal fixtures are from some Tim Holtz hardware I had in my stash. 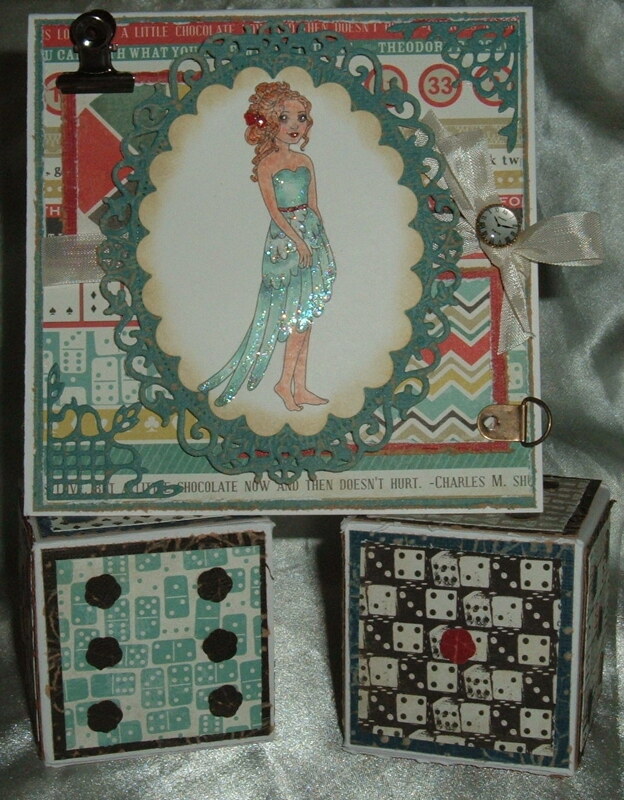 The dice are a variety of papers from the fun paper packs and the template I used was from here. It's great because the boxes can open up for goodies. Me, I'd fill it with some peanuts and chocolate! 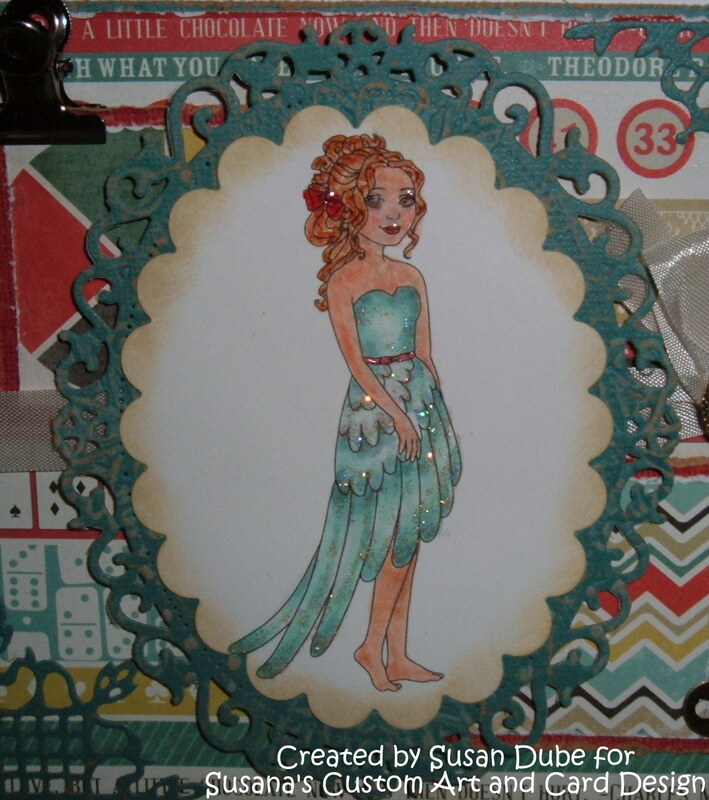 I used the Art Nouveau Embossing Folder by Couture Creations on the Core'dinations paper and the dots are made with a McGill petite flower punch. 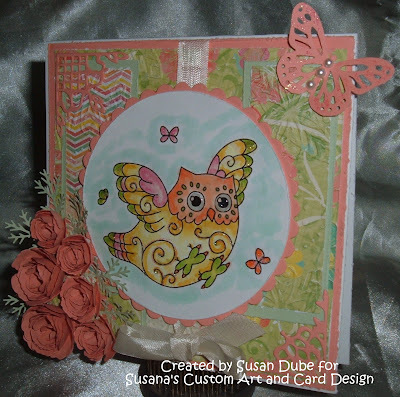 And now on to my whimsical and fun, Flying Owl! Isn't it a hoot?! 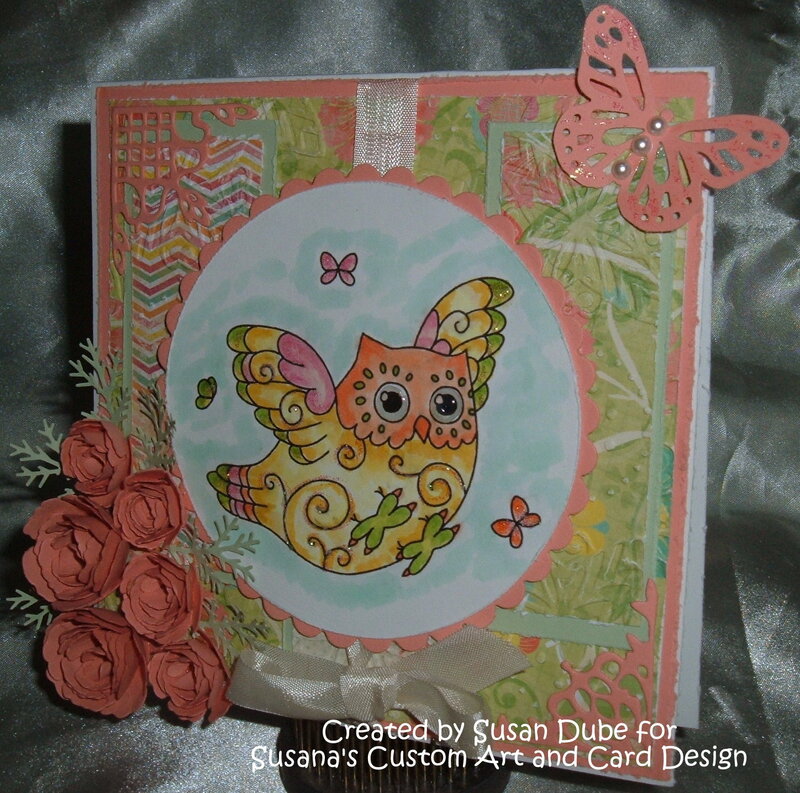 I love these fun, happy colors! 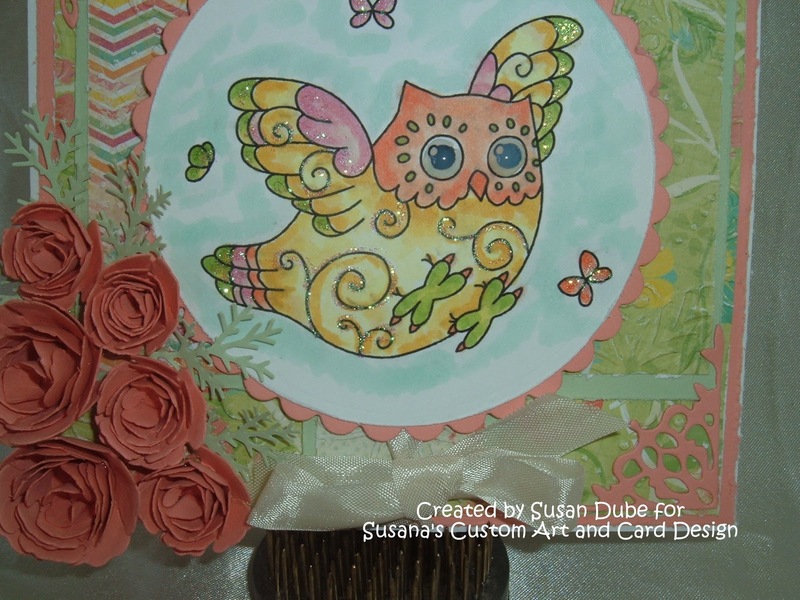 I know owls are brown, white, grey, black, you name it, but i wanted something light and fun! 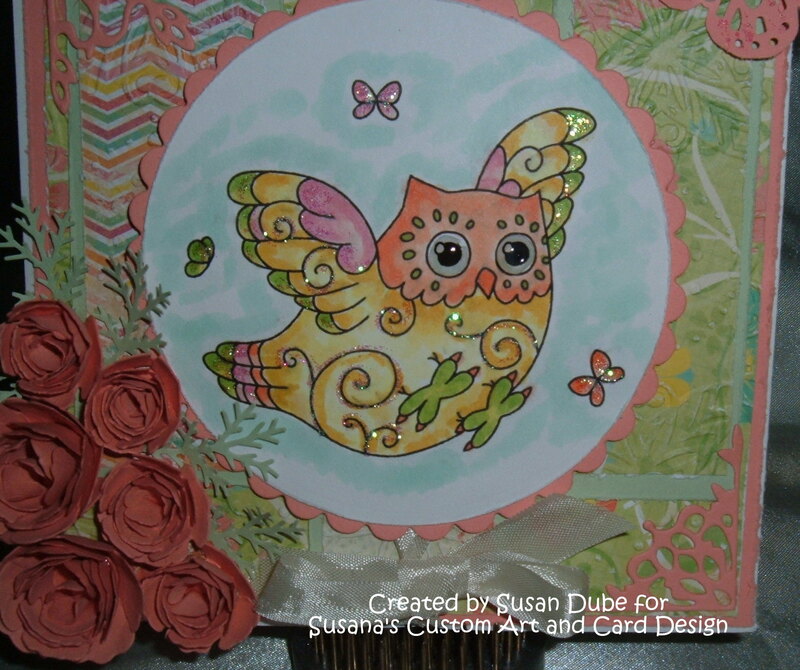 She's colored with copics and has Stickles in Stardust outlining her, on her wings and on the sweet butterflies. 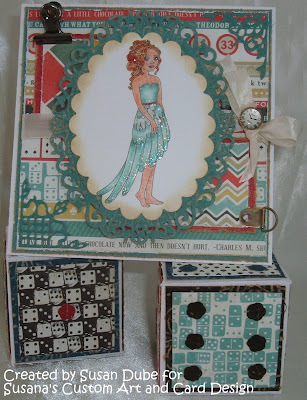 I thought the delicate Classic Corner Dies from SCACD would be a perfect touch! 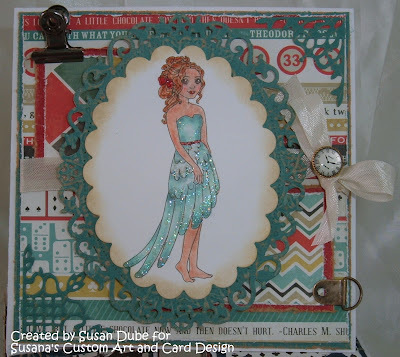 If you look closely, you can see the gorgeous pattern in the Art Nouveau Embossing Folder by Couture Creations. I added some handmade flowers from Spellbinders and the branches are from a Martha Stewart punch. The gorgeous paper is from a K&Company pack from my stash and the seam binding is from Stampin Up. 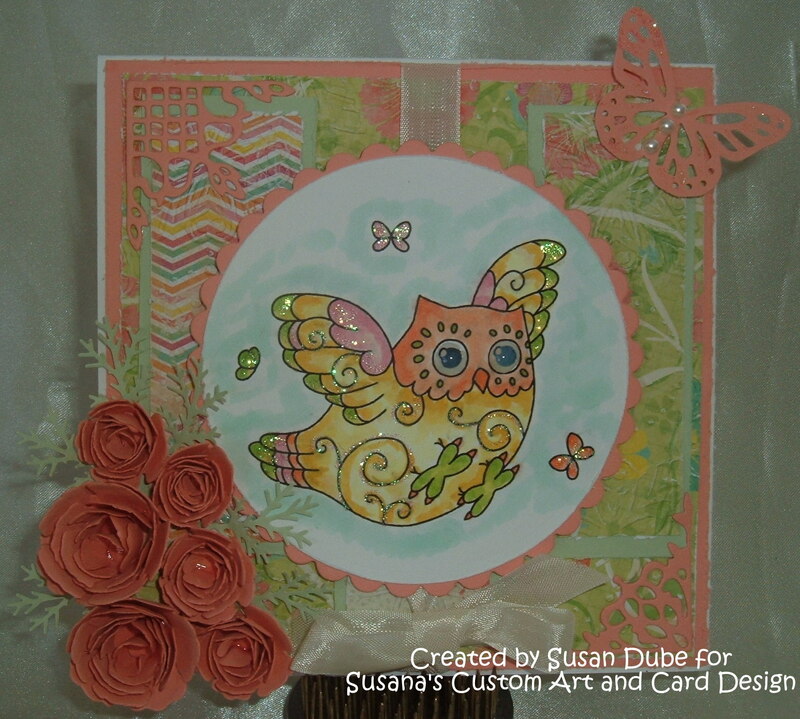 The pearls on the butterfly are from my stash. Doesn't she look so happy and fun? I added some Diamond Glaze to her eyes to make them pop and I think they came out pretty great! 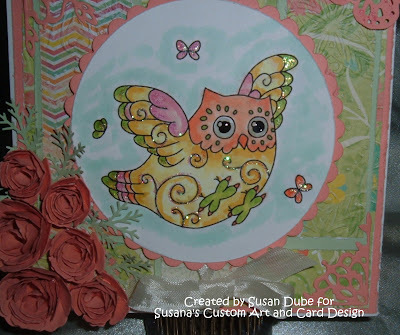 Now fly on over to the ever inspiring Susanna's blog and see what stunning project awaits you! Oh, this is one hop you're not going to want to miss a single step on! They are both fantastic!!! 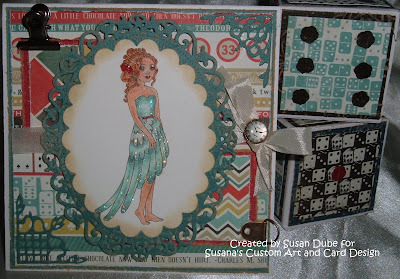 Love your patterned papers!! Oh Susan.... Both of them are wonderful. The theme with Aviana- brilliant. And seriously?!?! The dice? you ROCKSTAR!!!! 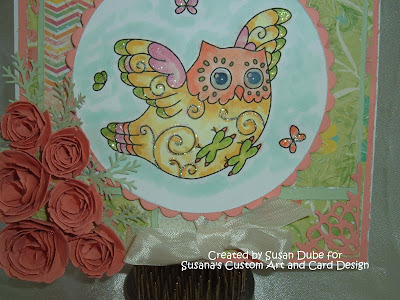 that owl is whimsical and happy. 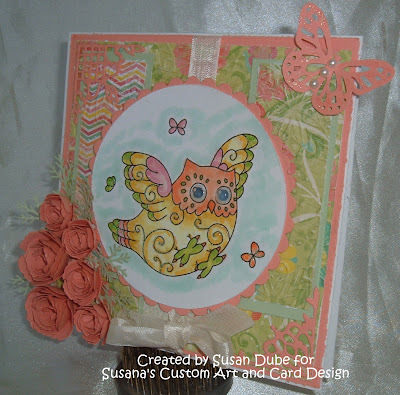 Adore the bright cheerful colors. Perfect choice with it~! So glad you joined us this hop! Beautiful work! 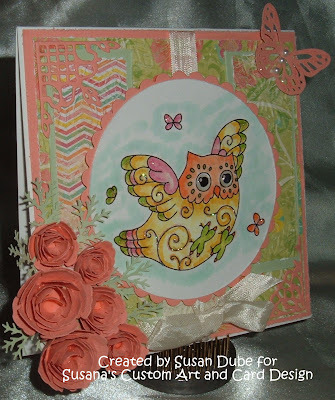 I love the little owl... he's just adorable! And the dice look awesome. OMG, your coloring and shading is fabulous!!!!!!!!! And I love your paper choices and matting layouts! Love all the sparkle on both cards! Wonderful job! Susan I JUST LOVE all the sparkle, and I LOVE how you did his eyes...SOOOO FABULOUS!!!!! Gorgeous work showcasing these cuties! Your efforts on the SCACD Hop are very much appreciated!!! Both cards are absolutely gorgeous. Wonderful coloring and design on both of them. 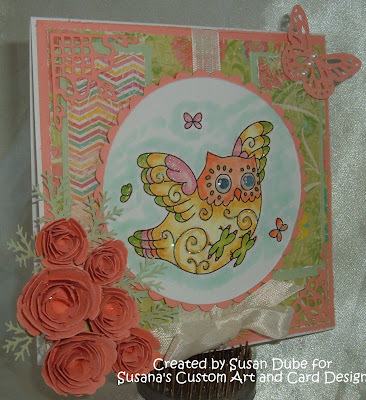 I love the color palettes and paper choices too! Both card are beautiful. Great job! both creations are awesome! I love your layout, colors and how you added more pop with the bling! Such a fabulous creation. Thank you for joining us at PCJ Challenge this Month.